AR-15 Advanced Tactical Rifle - Verdad Investigations & Protection, Inc.
Pre-requisite: This is an introduction to the AR-15 / M-4 Rifle course – or firearms training course of equivalent level or by instructor permission. This is a one day class which has been accelerated to build upon the dynamic, exercises of our AR-15 Combative Essentials Course. 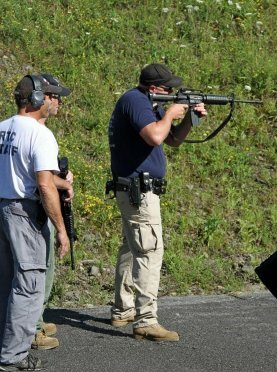 This course will focus on and build skills in which students will be operating their weapon at higher speeds employing tactical application techniques of the rifle platform in scenario based training exercises. • Firearms training safety review. • Principals of personal defense. • Rapid deployment methodology and concepts. • Mental conditioning and combat mindset. • Review fundamentals of shooting a rifle. • The natural action stance. • Methodology of shooting the rifle. • Loading / unloading the patrol rifle. • Review use of conventional and tactical sling systems. • Presentation from low ready, high ready and indoor ready. • Balancing speed and accuracy. • Enhanced tactical speed shooting concepts. • Reducing stimulus / response time. • Moving off the line of force. • Threat assessment and area scanning. • Engaging threats while advancing and withdrawing. • Engaging threats from static turns and pivots. • Engaging multiple threats while negotiating obstacles. • Dominating the weapon, threat and visual areas. • Ammunition management and reloading techniques. • Transition to secondary weapon system. • Multiple threat engagement strategies. • Close Quarter Battle (CQB) techniques. • Drugged assailant and body armor defeating drills. • Use of the flash sight picture vs. perfect sight alignment. • Front sight proximity shooting. • Man vs. man stress drill shoot-offs. • Up / down drills. Plus 500 rounds of rifle ammunition OR 22 LR ammunition can be substituted, conversion kits available at range for no fee.